Another one off the list. Last year around April I took profile photos of the kids for this project. I finally got around to cutting them out! The rate I am tracking on project meeting fruition seems to average out about 1.5 years per idea. 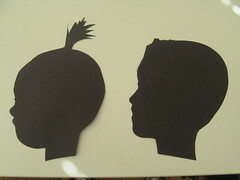 I really like how Rhys’ silhouette turned out, but Sloan has changed so much I am going to do hers over. She has just grown so much since those baby days. 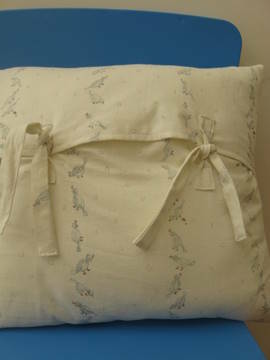 I just framed Rhys’ and will post some more photos during the week with the dino pillow completed. My husband just left today for an overseas work trip. 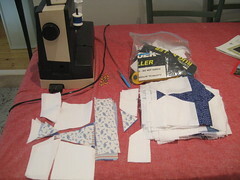 I plan to hunker down on the sewing machine at night while he is gone and hopefully “land the plane” on the plane quilt. Wish me luck! We are leaving 2008 behind tonight. I feel really good about this years sewing projects. Albeit, I am comparing it to the year before when Sloan arrived and I felt so tired all the time I didn’t sew a thing, so the comparison bar was set very low. 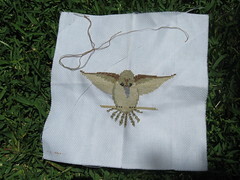 Here is the latest project that is my New Years resolution. I made this airplane quilt for Rhys three years ago. I cut two quilts out at the same time: one for Rhys and one for his cousin A. Well, here we are three years later and I am finally pulling out the bag and sewing it together. I have been trying to set a goal of five or six planes a night and it has been going well. Now we are back in party mode I don’t think it is going to be touched during the New Years celebrations. Back to it soon though! My other sewing resolution is I am trying to take a quilting class this year. Fingers crossed there is a space in the class I want and I can line up my babysitter at the correct time to make it happen. This is going to be my “thing” I do for me this year. I have a project that is going to really challenge me and I want to do it under the guidance of the quilt Yodas at Material Obsession. I hope you have a safe, happy New Years. I will be traipsing out in the heat in a few hours with the family to sit on the harbour and enjoy the spectacular show that our Sydney puts on. Happy New Year and Happy Sewing in 2009 to all. Still feeling very out of control during the holiday season. Christmas shopping is almost done, but every time I think it is almost over another forgotten present must be purchased! I posted awhile ago about a cross-stitch my Mom started but found too hard on her eyes. 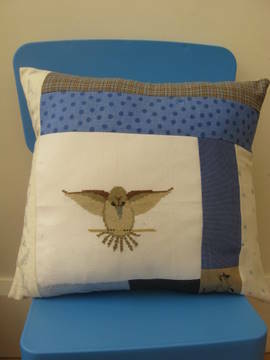 I finished it and here is the final result in a pillow. I even managed to post it earlier this week, so it just might make it to California for the holidays. 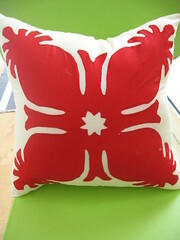 The fabric on the back is a gorgeous bird print I purchased from Superbuzzy. Hope the folks like it and that it will blend into the house decor. Otherwise, some fabric has been purchased for another lingering project that is not finished, more holiday craft supplies, and some t-shirts for pressies to be crafted. Between all this Christmas cheer and celebration, I have yet to think when I will start! Not to mention my hubbies birthday tomorrow. Have a great weekend everyone and deep breaths all around!!! !